Roland Faulknor was born in Muskegon, a place on the shore of Lake Michigan in Michigan on August 23rd, 1920. 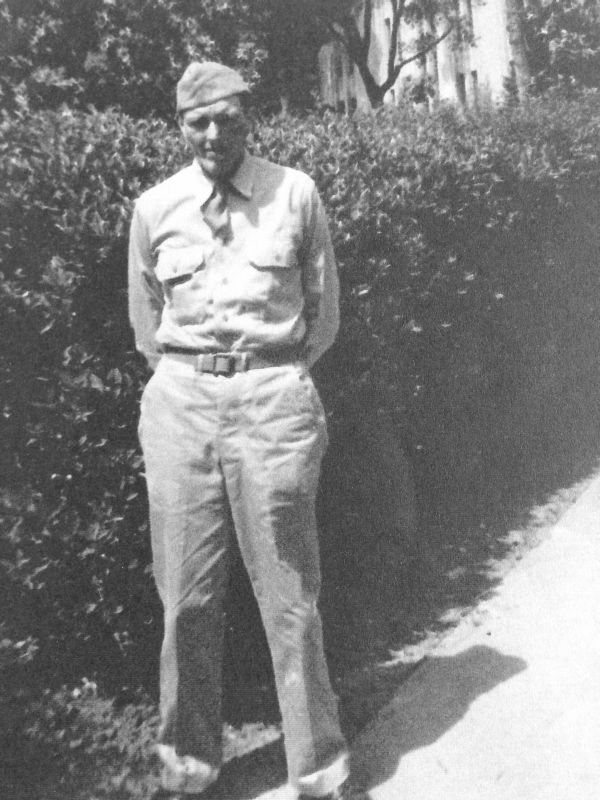 Here he graduated from the Fremont High School and was employed at Continental Motors Corporation and Doolittle’s Service Station on Getty Street before he entered service. Before entering the US Army, Roland married his love Barbara, and they became the parents of two children, Patricia Ruth and Roland James. 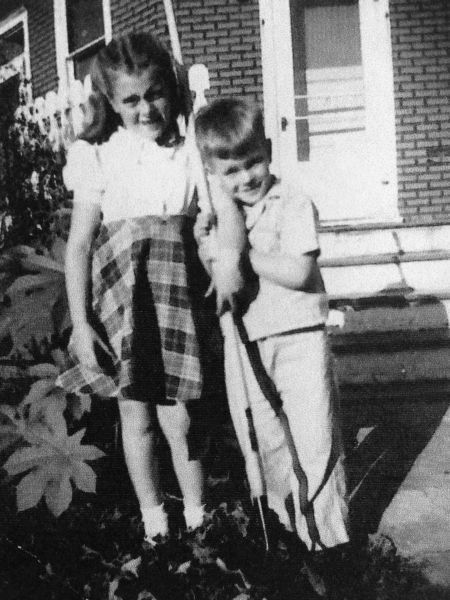 Roland’s children, Pat and Jim, 9 and 6 years old here. Roland entered the Army on March 29th, 1944 and trained at Camp Fannin, a U.S. Army Infantry Replacement Training Center and POW Camp located near Tyler, Texas. After being in England for a short time he went to France, fought through Normandy and Belgium and arrived at the German border in September 1944. By now, Roland was part of Company K, 60th Infantry Regiment, 9th Infantry Division. In Germany he participated in the Battle of the Hurtgen Forest. K Company moved out in September 1944 to capture a series of Pillboxes in the area now known as “Deadman’s Moore”. Brutal fighting kept the men from moving, and they were struggling to gain grounds for several weeks. Another attack was launched on October 6th, 1944, and again, the men of both the 39th and the 60th Infantry Regiments had to endure heavy fire from the enemy. Mortar and Artillery fire rained down on the men, and machine gun fire from the scattered pillboxes and trenches took the lives of many young men . During a lull in the battle, Roland managed to write his wife Barbara a V-mail letter. 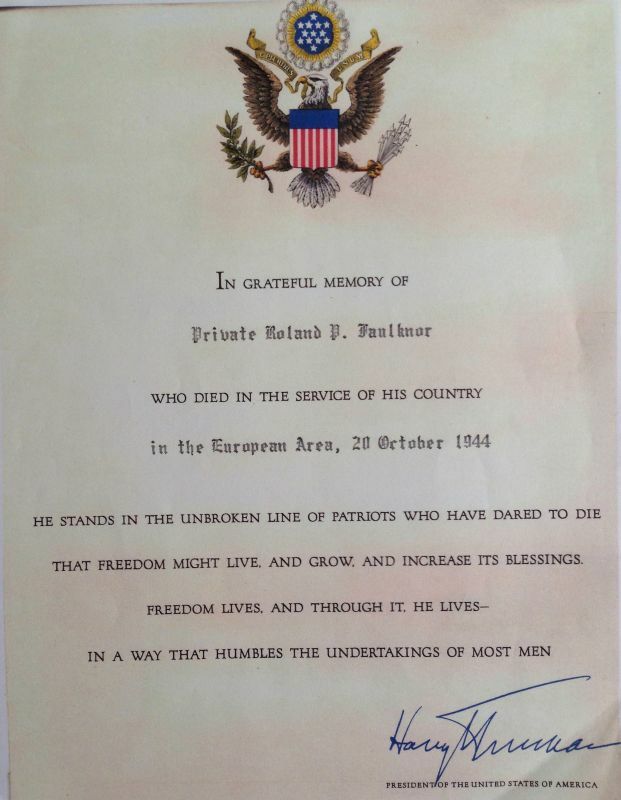 This letter was written on October 8th, 1944. In the letter he told his wife he got new overshoes and was happy to have dry feet. He also wrote that it was hard to get sleep some nites as it could get pretty noisy. He ended the letter with the words “Kiss Pat & Jim for me. I love you with all my heart Darling. All my love, Roly“. This letter would be the last letter he wrote to his darling wife before he went Missing In Action only 12 days later. On October 16th 1944, K Company of the 60th Infantry Regiment took up positions along the main 399 road and set up a defensive position. L an K Companies together held a line stretching north east along the road from the Raffelsbrand Road Junction towards Richelskaul . In the period between October 18th and 20th more defensive measures were done by placing tactical wire with booby traps in front of the forward positions. Road blocks and mine fields were established on the roads near the town of Germeter as well. In order to keep the area safe extensive patrolling was done. What happened to Roland Faulknor next is not clear yet. 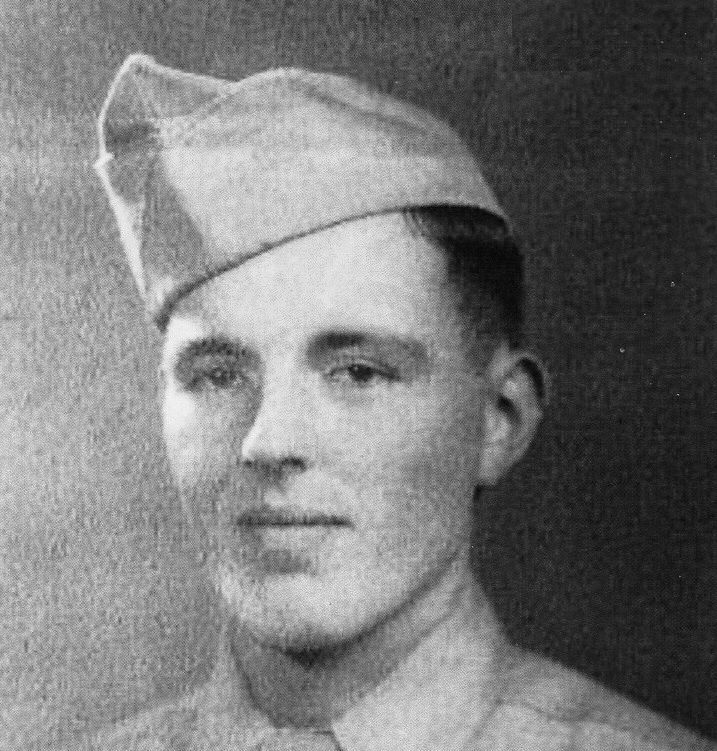 He could have been in one of the forward positions and it might have been overrun by the enemy, or he might have joined a patrol that ran into a German ambush. During these October 1944 days, the fighting was though. Many units fought closely together, and sometimes the lines crossed and men wandered into the other unit’s area. From the After Action Reports and Combat Interviews we do know that the area where Roland was last seen alive would have been just south of Richelskaul, and east of the 399 Road. The one thing that is confirmed is that Private Faulknor went Missing In Action on October 20th, 1944. At this time his children were 3,5 years and 6 months old. Roland was only 24 years old. A local newspaper ran his story as well. 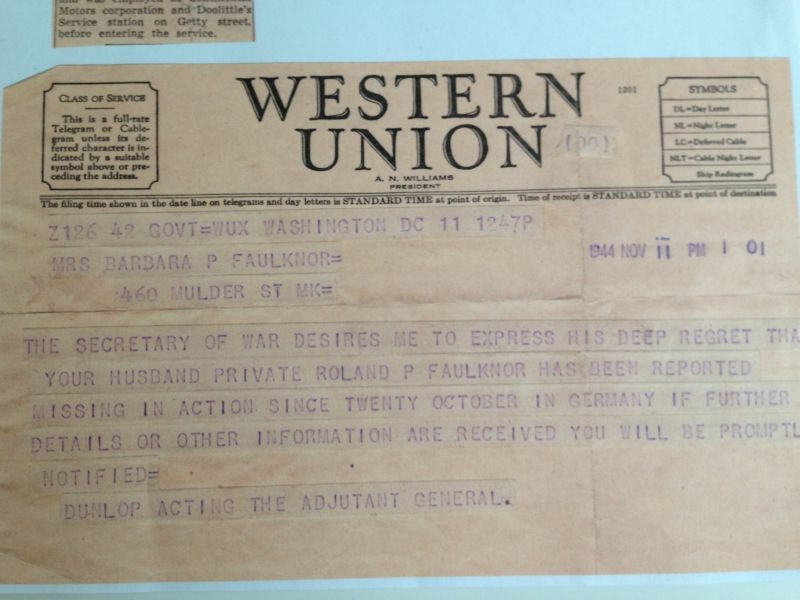 On November 11th 1944, Roland’s wife Barbara got the devastating news via the Western Union Telegram. The Western Union Telegram given to Roland’s wife Barbara, telling her the devastating news that her husband was Missing In Action. 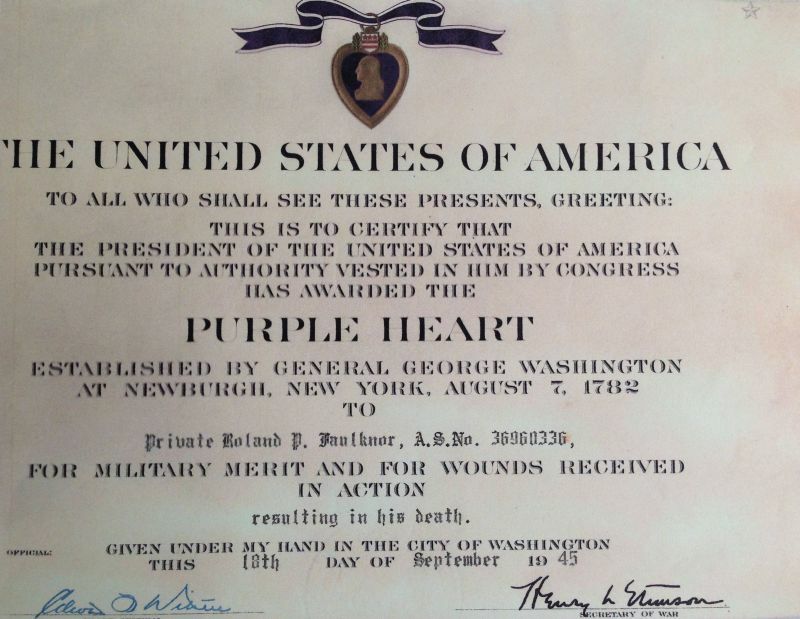 Roland P. Faulknor was awarded the Purple Heart Medal for wounds received in action that resulted in his death. 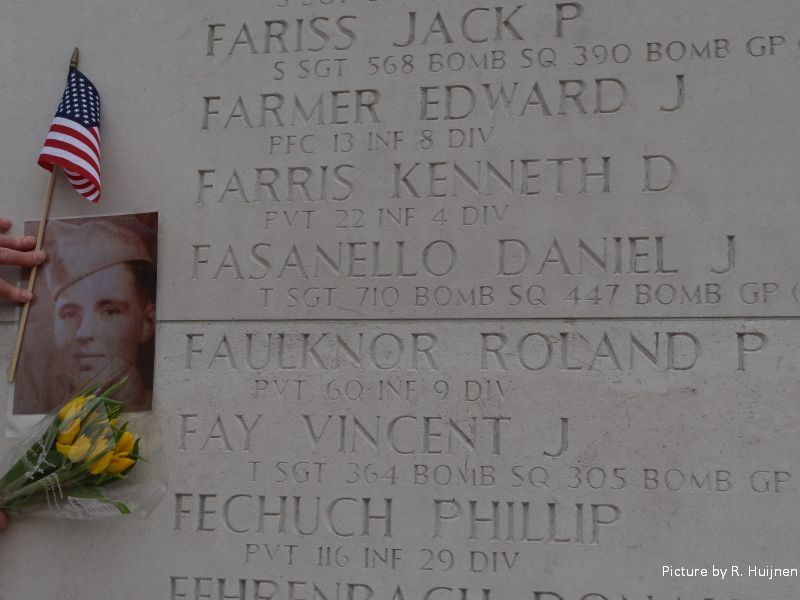 Roland is now forever remembered on the Wall of Missing at the US Cemetery at Margraten. Through this Tribute Page, we now know how Roland looked, and will never be forgotten. The price he paid for our freedom will never be forgotten.